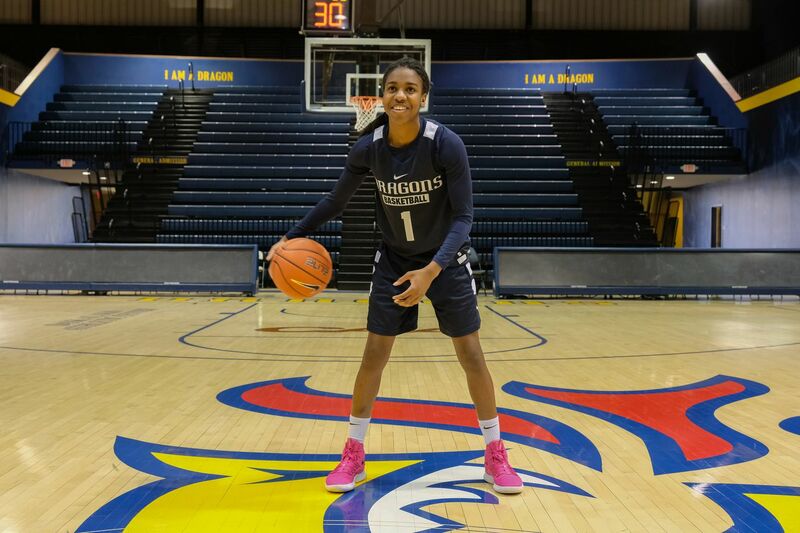 Keishana Washington, a freshman guard at Drexel, is coach Denise Dillon's first Canadian recruit. The Drexel women’s basketball team is a cultural melting pot, and that’s how head coach Denise Dillon prefers it. “Obviously, you want to create a culture with diversity and players from different cultures, so that our domestic players can really get an understanding of what it’s like to come such a distance,” said Dillon, who has successfully recruited 15 international players to the program over 15 seasons. What started out as the only way Dillon could get top players for Drexel is now the program’s niche. Recruiting local talent was difficult when Dillon arrived in 2004. The 10 previous seasons were losing ones. The Dragons had never reached postseason play in 23 NCAA seasons. Associate coach Amy Mallon suggested the program try recruiting internationally. The rest is history. The program had its most international players (five) during its first WNIT appearance in 2010. Last fall, Drexel threw a Canadian Thanksgiving party for freshman point guard Keishana Washington. Despite the U.S. holiday of Columbus Day falling on the same date, the Dragons wanted the rookie to feel at home. “Being so far from home, I get homesick sometimes,” said Washington, Dillon’s first Canadian player. There are three other international players on Drexel’s roster: Tereza Kracikova of Czech Republic, Eline Maesschalck of Belgium, and Ana Ferariu of Romania. Drexel is second in the Colonial Athletic Association standings with a 13-3 record (21-6 overall). The team recently was on a 12-game winning streak before losing in triple overtime to William and Mary on Friday. Denise Dillon hugs Taylor Wootton. Standard NCAA rules apply to international recruitment. Drexel assistant coach Stacy Weiss first spotted Washington at a Chicago AAU tournament during her sophomore year in high school. Weiss sent her a text shortly after the tournament, informing her of the school’s interest in her. Dillon said she sent written letters and communicated through Washington’s AAU and high school coaches. NCAA rules restrict universities from direct contact with recruits before their junior year of high school. By November of Washington’s junior year, Mallon and Dillon visited her home before Washington’s May campus visit. She finalized her decision to join the Dragons shortly after. Keishana Washington, freshman guard on the Drexel women's basketball team, is coach Denise Dillon's first Canadian recruit. Mallon has taken the reins at Drexel on European and Asian recruitment. Having played in Luxembourg and for the Irish national team, Mallon has seeds planted overseas. She first found success recruiting internationally when she lured top recruits to St. Joseph’s and Villanova as an assistant coach. Mallon says Drexel pays for scouting services, BlueStar Europe and BlueStar Asia. With a list of players in hand, she travels to Europe every other summer to watch FIBA’s amateur basketball tournaments. Her list of players includes recommendations from scouts and the recruitment service. Asia has become a focus for the program because former Drexel player Renee Johnson-Allen is the director of the BlueStar program based in Singapore. Drexel expects Washington will be active in the recruiting process as previous international players have been.